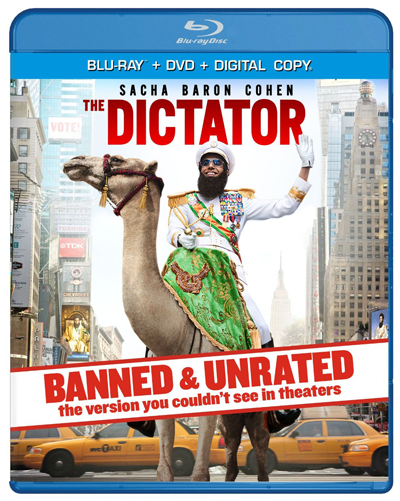 The Dictator remains one of 2012’s most underrated movies and personally, I couldn’t be more psyched about its upcoming release on all my favourite home entertainment formats. But if the UK release is planning on going the way of the American version, Paramount can shove it. While the emotive use of the word ‘couldn’t’ implies that someone or something was actively stopping you from seeing this version during the film’s theatrical run, all this phrase really means is that the cut of the film included on the disc (which runs 83 minutes — the same as the cinema version) wasn’t the one that Paramount Pictures elected to release back in May. Perhaps it contains a wealth of envelope-pushing satirical content ‘too hot’ for the stuffy censors at the MPAA ratings board, or more likely, a few alternate angles and a couple of overlong improv scenes. Translation: we chose not to get the film rated because we thought it would sell better. This is where it gets a little complicated. There’s absolutely no record whatsoever of the film requiring changes of any kind to secure an R rating in the United States, and the press release fails to expand on how, why or when this version of the film was supposedly ‘banned’ by anyone. The same theatrical version was released in the UK as in the US, and the BBFC note no instances of cuts being required to pass it at 15. Could it possibly be that the film was never in fact banned at all, and that Paramount are simply using the term as a meaningless buzz word in an attempt to shift a couple thousand more units of their misunderstood little political satire? Could anyone really be so cynical? Ball’s in your court, Paramount Pictures.